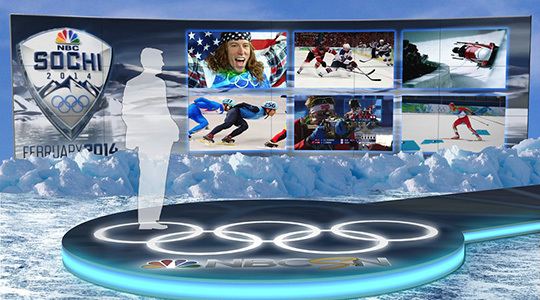 The 2014 Olympics in Sochi are now less than two months away… is your station ready? From preparing the medal winner graphics, to updating the music library for highlights; the clock is ticking down. The Olympics are a unique event to cover, not just for the world class sports, they also present many pitfalls from a legal stand point. The Olympics have become one of the largest multiple platform events, the question is, how can you add new revenue to your coverage without stepping on any toes? There are always local advertisers who want the illustrious rings in ads, but this opens stations up to liability. So, you have to look around for new ways to work in sponsorships. One unique method to add new excitement to Olympic coverage is to change sets. For some stations, this can easily be done. For others, it could mean a large expense. Until now. With the rise in virtual set design, new environments are as easy as a green screen. Virtual sets allow dynamic changes in backgrounds, all at a reduced cost. Click here to learn more about FX Design Group’s Olympic background. FX Design Group is an advertiser on NewscastStudio and contributed content to this article.